If you’ve clicked on the “Library” tab in Mixcraft, I’m sure you’ve noticed that even the entry-level Mixcraft Home Studio edition includes over 2000 loops and effects. Used “as-is,” you can easily create anything from basic rhythm sections to entire songs. But many users may not realize that with some crafty cutting, slicing, and tuning tricks, the loop library possesses infinite potential for unique, creative, and sometimes really out there manipulation. In this blog, I’ll take a relatively straightforward drum loop clip, hack up each instrument hit into its own clip, then rearrange the individual hits to create a brand new drum loop. Then we’ll do even more crazy stuff! I chose the enticingly named “Kick Snare Hat”, in the dubstep style, so the kick and snare drums are suitably aggressive. Now I’m going to cut up the loop into individual drum hits using Mixcraft’s Split function, accessible either by right-clicking and selecting it, or with the key shortcut Control-T.
… that’s because all sample loops have an inherent original tempo. 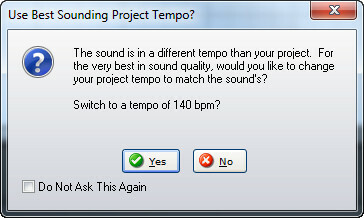 If you click “yes,” Mixcraft automatically resets the project’s tempo to the loop’s original tempo. If you click “no,” Mixcraft automatically time-stretches or time-compresses the loop’s playback to match the current project tempo. This can potentially compromise the sound quality of the loop, dependent on how far the loop’s original tempo is from the current project tempo. That said, you can often get away with pretty radical disparities. In our example, we’re gonna keep the tempo at 130 BPM. Of course, changing the pitches of sliced up clips can be applied to music loops as well. 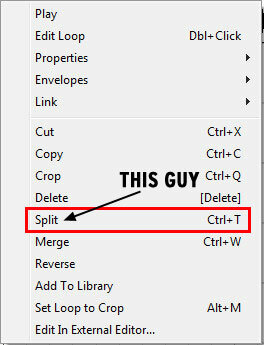 Here I used a synth bass loop, and changed the keys of the cut up clips for more musical variation. Specifically, I added a sixteenth-note ping-pong delay (with a lot of feedback) to one of the kicks and a ton of distortion, and midrange-bumped EQ to another (as well as using changing the pitch of each hit as shown earlier). I also made a new sixteenth note high-hat part where I placed every other high-hat on a separate audio track, then panned the two tracks hard left and right; I also added a big flanger plugin on both tracks for swoopy goodness. Finally, I pulled one of the snare drums down to its own track and added a lot of distortion, midrange-bump EQ, and reverb for a sort of faux-handclap smash. These are kind of random examples, but I sort of threw the proverbial kitchen sink at it just to give you some ideas – make it your own, that’s the fun part! (More of the standard Zeros & Ones blog disclaimer – I used Mixcraft Pro Studio 6, so there’s a chance your version may not include all the plugins and loops I used). Great demo/blog from Mitchell, this is why Mixcraft rules because Acoustica & users of the product actually care about the product & the people who buy it. Support from everyone has always been good & Mixcraft 6 has never crashed on my pc. Why don’t I watch these more often??? Great stuff, thanks! Mitchell, you’re killin’ me !!! Great stuff buddy !!! Long live Mixcraft !!! Great tutorials. Are there any more coming ? Most of the tutorials available deal with quite simple stuff. Yours dig deeper into how versatile Mixcraft is. I’m sure more of your in-depth tutorials will appeal to those still deciding on which DAW they should go for. Great job ! Excellent stuff here. Possibilities are endless. What I really like about MC is the simplicity of everything but more importantly everything just works the way it is intended. Kudos to MixCraft and the Acoustica team! !